At 177 years-old Simons may be one of the oldest retailers in Canada, but its new Edmonton store has the largest solar system in the city. Standing on top of the new Simons at Londonderry Mall I am surrounded by a sea of 996 solar modules and below in the parking lot I have a birds-eye view of 720 more solar modules on two solar car ports. The solar system is 636 kilowatts, the largest in Edmonton and enough to provide Simons new 90,000 square foot store with half of it’s electricity. There is a buzz about this store and the project. In the parking lot a group of electric vehicle owners are starting to assemble, invited by the projects’ solar engineer Gordon Howell. There are a couple of Teslas, a pair of Nissan Leafs and a new BMW i3 EV. They are members of the Electric Vehicle Association of Alberta and the got word about this project through their very active Facebook page. The electric car owners love the solar, but they are even more jazzed about the three EV charging stations Simons added to the solar car ports at the store. One of the chargers is a level three charger capable of charging an electric car from empty in 30 minutes. The vision behind this new kind of sustainable, solar powered store comes from the companies CEO. Peter Simons is the CEO of Las Maison Simons and the fifth generation in his family to run the 177-year-old company that started in Quebec. The company is privately held, has no shareholders and clearly follows the beat of its own drummer. Peter may not be a musician, but has degrees in science and business from Carleton and the University of Western Ontario. Each of the Simons stores has a theme, an original piece of artwork and a distinct feel. Alberta artist and activist Peter von Tiesenhausen agreed to his first ever corporate commission for the Londonderry store a piece entitled Drawn by Desire. One big theme in the Londonderry store is sustainability–it’s part of a larger effort to make all Simons stores more sustainable. In the Londonderry store Simons converted all of the lighting systems to LEDs: “And that cut our electricity consumption by 30 to 40 per cent … and then we started attacking this question of how to produce this clean energy in the environment for the store to go toward net-zero,” says Peter Simons. Yes, Simons had barely started describing the energy efficiency, solar and electric vehicle charging innovations at the new Londonderry store when he said their ultimate goal is build a net-zero store. “In the next store we’ve used what we’ve learned here and we’ve built on it (adding geothermal) and we’re hoping to next spring open a zero energy store in the Quebec City,” says Simons. Simons is serious about energy sustainability. “For me this is an extension of that idea of if I believe that Canada really is working toward sustainability and moving into a new type of energy economy, businesses have a role to play in that. And I just have to go to bed every night hoping that customers will appreciate businesses that have that that connection to Canada to the communities, to the local communities and the projects that we’re trying to do,” says Simons. Until recently Peter Simons drove an old SUV with 200,000 km on it. “Keeping your car a long time is good for the environment–that’s a first step,” says Simons. But Peter Simons wanted to learn about electric vehicles. 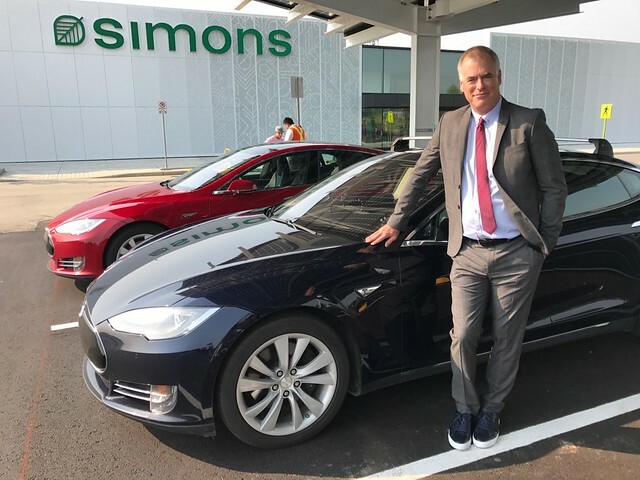 Simons built the largest Edmonton solar system complete with level three electric vehicle chargers by working with well-known local solar engineer Gordon Howell and one of Edmonton’s successful upstart solar companies, Great Canadian Solar. Simons says there are two big issues our generation is going to face. “Our issues today are definitely going to be sustainability and social equality and how we address those. I must confess, at times it was easy to forget I was talking to a Canadian retail mogul who just opened his 15th store. Simons may an institution in Quebec, but I did confess to Peter Simons that the first time I set foot in a Simons was two days before the interview when my daughter Jenna toured me around their huge West Edmonton Store. She knew all about Simons, as do Quebecors who’ve been shopping there for 177 years. Simons calls itself a fashion-forward store and it’s home to their in-house brands Djab, Twik, Le31 and iFive. Simons is committed to sustainability, but it’s doesn’t come cheap. Transitioning to energy efficient LEDs, producing clean energy and soon opening a solar powered, geothermal heated and cooled net-zero store in Quebec is all part of a four year project for Simons. Time will tell, but it looks like Peter Simons’ grandkids won’t think he was so prehistoric after all.